Facetime has become very popular way for making video calls from iPhone. Even for official video calls,it has become good alternative for Skype & Whatsapp calls. Unfortunately, Apple didn’t give a direct option to record Face time video calls on iPhone, but only on Mac using Quicktime. In this post, I will explain how to record Facetime on iPhone using Windows PC or Laptop for free using software called Lonelyscreen. In Macbook, it’s very easy to record Apple face time video calls. Open QuickTime and record. But when using iPhone, we cannot record any calls due to it’s software limitation. Only option to “directly” record facetime on iPhone is to jailbreak it and install screen recorder software. I will explain about this in coming posts. 1. Download and install Lonelyscreen [direct download link given at end of post] on Windows PC or laptop. 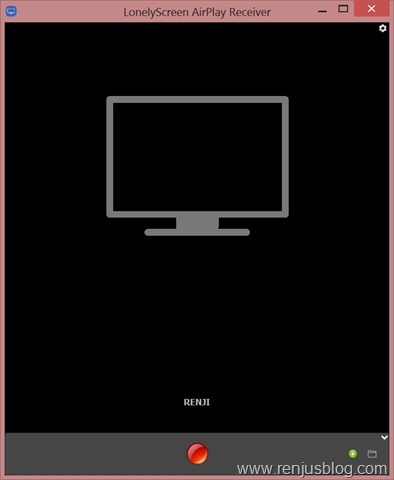 This software is a free Airplay receiver for Windows, like an Apple TV on your desktop. 2. Connect laptop to Wifi network & Open Lonelyscreen software. Change server name to what ever you like [optional]. In my case I changed it to “RENJ”. No other special configuration required. You will be recording facetime video & audio calls on PC with this software. 3. In your iPhone, there is no software to be installed. Connect iPhone to same network as your windows PC. 4. Once both phone & PC is connected to same wifi network, slide up in iphone to open control centre. 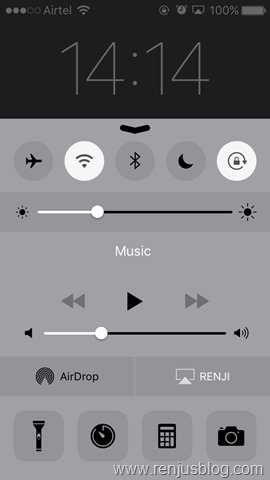 You’ll be able to see the Airplay option (next to Airdrop) enabled as shown in pic below. 5. Click on Airplay option(your server name will appear here). 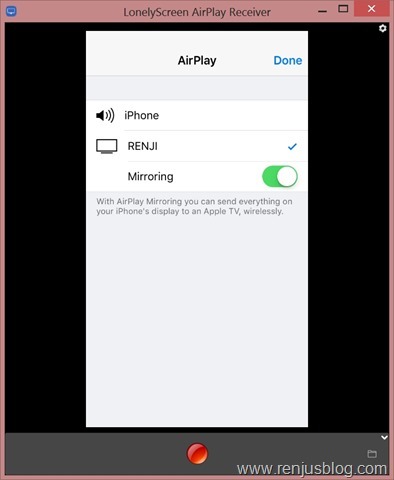 Select the Airplay server and enable Mirroring. 6. Now in you PC, you can see the iphone screen being mirrored. 7. Now make a facetime call from your iPhone & you will be able to see in the windows PC. Press red button on lonelyscreen software to begin Facetime recording. 8. Once you finish talking over facetime, click the stop record button in software. Recorded facetime calls will be saved to PC. Just click on folder icon to bottom right of lonelyscreen to open facetime recorded videos. If you have any query configuring facetime recording in windows, let us know through comments. UPDATE[13/02/2016]: I got many requests on how to record factime videos directly on iPhone & mac. For iPhone, I mainly use an app called Display recorder which can be downloaded from this link. It supports both iPhone & iPad. You can record both video and audio using this app. The recorded videos can be played anytime later and it also supports many formats of recording. One thing to be noted is it records mic audio only if ‘H.264+mic’ option is selected in settings. I faced one problem btw..Once I recorded facetime using software..next time when i try to connect airplay, it’s showing blank screen. I restart software and it works. Which version of iOS are you using? Update lonelyscreen to latest version if you are using iOS 9+ for recording screen. Can we record facetime directly on iPhone? Yes. it’s possible to record directly to iphone. But you will need to jailbreak and install display recorder software from cydia. Link given in post. Wow! Never knew about this freeware to record iphone. Thanks a lot!! It worked. Followed Same method for recording iPad video call screen.. I find that when you click on the icon it doesn’t seem to come up straight away, also I can hear the other person on the face time recording when I play it back but not my own voice ? I downloaded the lonelyScreen software and prepped both the IPhone & PC to airplay mirroring. But the airplay mirroring screen on laptop did not appear so I am stuck. Help how to resolve this problem? When I use the software, screen mirroring works, but both speaker and mike on the iphone are automatically muted and the mike and speaker on the laptop is turned on — although the camera on the iphone is still working. Result is that I can neither use the phone or computer for the call. How to resolve this so I can use the phone (eg unmute the mike and speaker, remute them on the computer)?